The 590 Densimeter Foal Upgrade requires the use of ARS' 180 ul Displacement Pipette, ARS p/n 594KR-1800. The older Rainin pipette, ARS p/n 537-371 cannot be used. Customers who already own the ARS Pipette, and wish to upgrade their 590 Densimeter for Foal IgG testing need only purchase the 590 Densimeter Foal IgG Upgrade below (IGG-101-590A-UG / IGG-101-590B-UG). The 590 Densimeter may be upgraded to measure both sperm concentrations and foal IgG levels. Once loaded, the operator may choose between sperm concentration and foal IgG measurements by simply selecting the desired operation. Current 590 owners may purchase the 590 Densimeter Foal IgG Upgrade which includes the IgG calibration CD, users guide, and supplies for the first 10 tests. 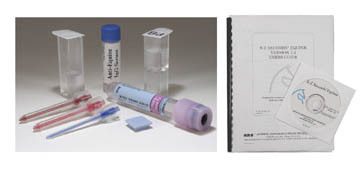 ARS recommends that the Foal IgG Test Supply Kit/Upgrade be in transit no more than two (2) days. It has been shown that extended exposure to excessive heat may damage one of the kit components (the Anti-Equine IgG Serum). Please select the appropriate shipping method to meet the two (2) day recommendation. The customer should take into consideration the day of the week the product will be shipped when choosing a shipping method. Please select a shipping option (below) to indicating how you want your IgG Test Supply Kit/Upgrade shipped. 2 day service entered after 9:30 a.m.